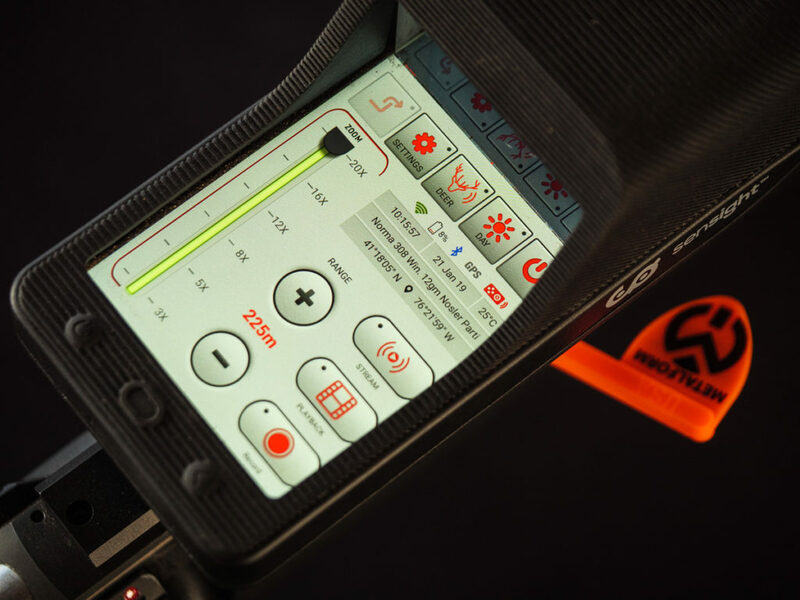 Sensight’s intuitive touch screen makes it easy to dial DOPE, zoom in, connect to your phone, and a bunch of other stuff. 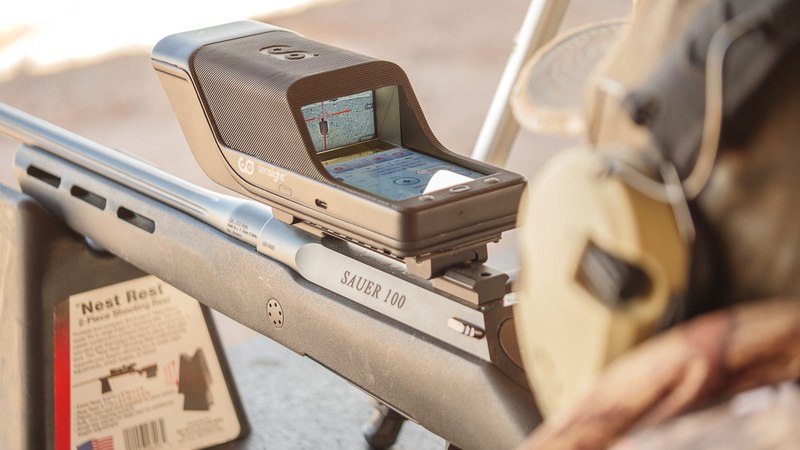 In an age of carbon-fiber rifle barrels and high-tech polycarbonate stocks, it’s about time technology was applied to the rifle’s scope. The Sensight digital scope applies technology to the scope to make it more powerful, faster, and easier to use–and it does it well. The Sensight is a fully digital scope that automatically applies DOPE and shows you the reticle over the target without needing input from you besides the distance. You just input the distance on the touch screen, line up the reticle on your target and press the trigger. I used it briefly, and it was intuitive and simple to use. It was a little like playing a video game, and a little like using a digital camera. The results, however, were flawless. 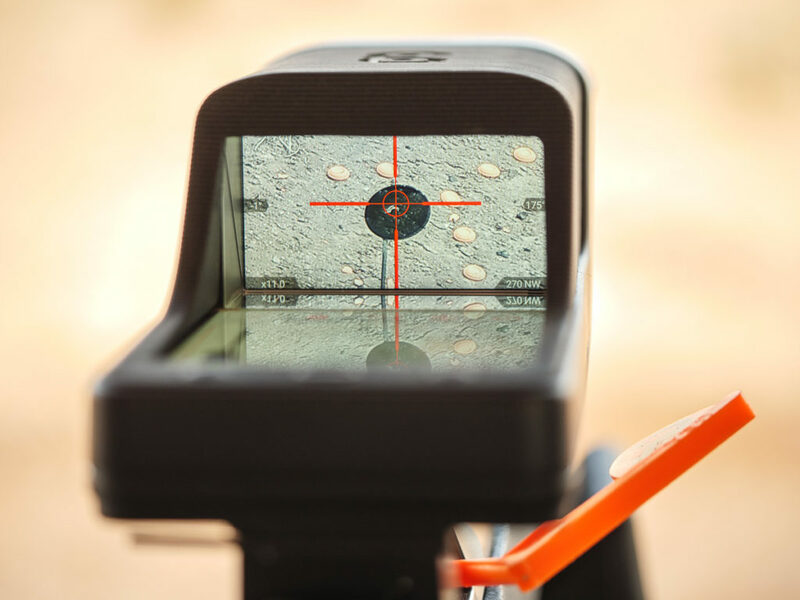 Whether for steel or live game, this scope makes it easier to destroy your target. 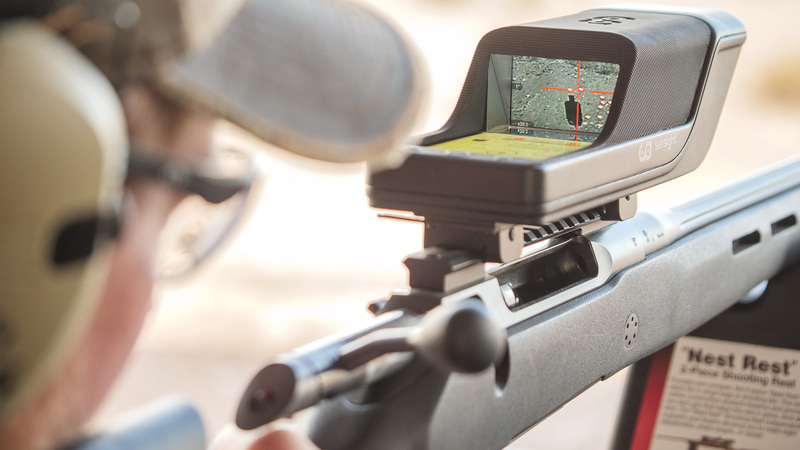 Sensight’s view screen allows you to shoot with both eyes open and makes it easier to keep the sight picture after you press the trigger. There are two cameras and sensors facing forward out of the Sensight. One camera is for daylight, and one is for lowlight and can be used at night with additional infrared illumination. The cameras interface with the body, which uses the Android OS. The cameras tilt and zoom internally–up to 20x zoom is built in. You can increase the zoom on the touch screen, or using a remote control button you can strap onto your stock so that you don’t have to move your hands to adjust the zoom. Before you go hunting, you’ll enter your ballistic data and it will move the reticle according to distance. Two cameras and a sensor allow Sensight to see the world and dial your DOPE. One camera is for daylight and the other is for low light (something like ten minutes longer than you can see with an optical scope after sunset) and it works in the dark if you use an additional IR light. Now, all that is really cool, but it does more. You can connect to the Sensight app on your phone (iOS and Android) and see and control the whole thing from your device. Yeah, you can even view the field outside your blind without moving around. You can also record your shots with its 32GB internal memory. Coyotes beware: it can connect to certain range finder models and adjust distance automatically based on the range finder data (future models will have a built-in range finder, but you don’t need to wait; this tool is ready to use now). It’s wider than most optical sites, but shorter, and it’s 1.2 lbs is similar to other quality optical scopes. Because it’s a digital screen, you can shoot with both eyes open, and there is no eye-relief distance. Its battery lasts about eight hours and it charges via USB-C, and you can use it while it’s charging so if you bring a USB battery there’s no downtime. It mounts to Picatinny and Weaver rails. It weighs just 1.2 pounds, including mounts, so it’s similar to other scopes. 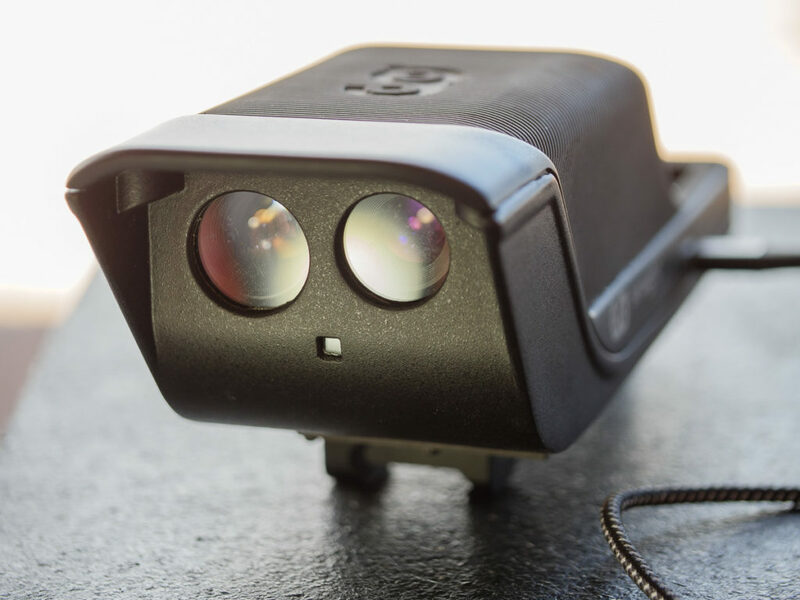 Sensight seeks to marry the accuracy and dependability of optical scopes with the ease of use and bioptic view of red dot sights. Is this a serious tool? I sat down at the bench and immediately hit targets at 350 yards. It’s intuitive to operate. Because I could use both eyes to view the field it was much easier to not lose the sight picture with each shot which made felt recoil seem reduced. It’s been tested on calibers up to .338 Lapua and it keeps zero. The catch? It’s not yet on the market (later this year), but the full MSRP will be under $1,200. It’s made in Israel and it’s being distributed in the U.S. by people who know what they’re doing. This tool not only makes it easier to shoot, but it also makes it easier to be a shooter and hunter. This is worth your consideration. Visit the Sensight website to learn more. Could this be easier to use? 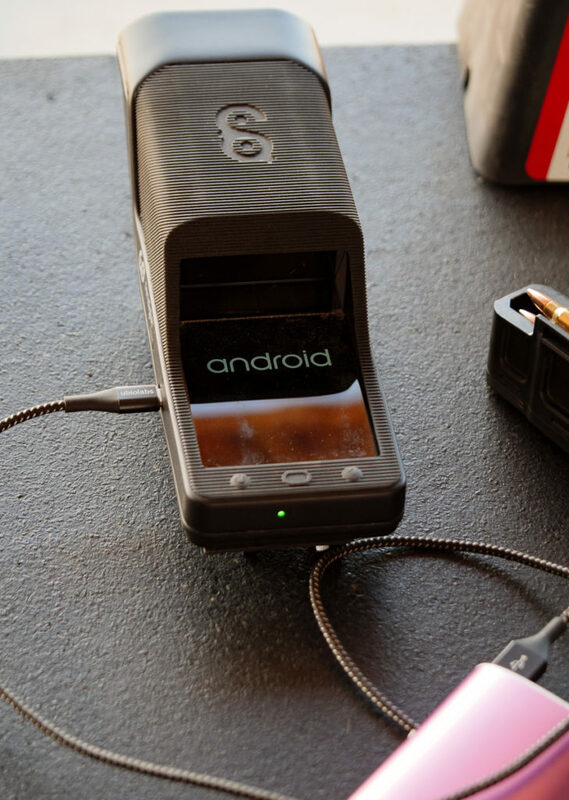 It runs on the dependable Android OS, it charges with a USB-C cord, and the battery lasts about 8 hours and it works while charging so there is zero downtime in the field. Let’s get my digits scope, laptop, cell phone, and space heater. Let’s drive our 15000 dollar utv right up to the shooting house and get in the elevator and go to up. Sit in my lazy boy and get on Facebook til a deer walks out And eats from the feeder that’s 30 yards away. I love guns… especially rifles but sometimes I think it gets taken too far. It seems this scope just takes all the fun out of it. As for Cisco, there is a lot of “Hunters” that after years of hunting and have been injured may need some help… This is no difference than you carring a range finder, a wind meter, and a ballistic calculator with you… Because what you are saying is that any advancement to make it easier to achieve your goal is Cheating?? Well I’m sure that when spears were invented the guys throwing rocks thought that was cheating, then someone invented the bow, and they were cheating and not hunters, then came smoothbore gun and they were cheating, and what about rifling? I’m sure they were cheaters because muskets were only good for about 50 yards but rifles were good way out to 100 yards if you practice, and then came sights on rifles more cheaters, then came repeaters that could fire rapid shots to kill animals quicker… Who would cheat like that? Then came the scope, anyone that uses a scope must be a cheater and not a hunter!! Then came range finders and wind meters and so on and on and on… Each generation before calls the next gen cheaters because they made it easier to reach the same goal, by putting meat on the table… I have been trying to get someone to build a scope that has all the features of range-finder, wind meter, and ballistic calculator all in one so I don’t get 3 miles into the woods and find I left the range finder on the seat of the truck… If I have my gun I have everything all in one package… Period!! Maybe when they come out with ver-2 it will have a bubble inside to adjust and calculate if you are shooting up hill or down hill, and a built in compass to adjust for parallax as well as a rangefinder good to 1800 Meters so we can do accurate shooting easy at 1000+ yards so we can practice at the range more before going “Hunting”!! As far as Drones or Robots doing the hunting for us I say if your over 65 or are handicapped by a accident, why the hell not… So unless you go out “Hunting” with your bare hands, YOU ARE CHEATING TOO!!!!! And hopefully a bunch of companies start making the “ALL” in one scopes so it drives the prices down to where most people can afford them, as they shouldn’t cost way more than the guns!!! I appreciate what you are saying, however, methods of killing were developed according to the need to kill other human beings. Tools for hunting was and is a by product…by the way, I love the smell of burnt gun propellant in the morning! I could have missed it in the article, but, how much does it $$$$$$$$$$. I`ll bet its a lot…….. I am a photographer with a pro quality, high end CANON DSR, AND ILL BE DAMNED IF I WOULD MOUNT IT ON MY S.W. MP 10…… TO ABSORB THAT KIND OF PUNISHMENT….. but I`m sure the price of this unit will keep me off it for quite awile…… happy trails…. Does this Optic comply with the rules and regulations of Big Game Hunting in Colorado? Well were did my comment go. People always look for a short cut that will replace hunting experience and marksmanship. The digital wonder will not hold your rifle steady for the shot as only you can do that after hours and hours of practice which is something the once a year hunter seldom possess. Will the device stand up under wind and rain and snow and what will happen if you drop the rifle. Will the plasticky wonder device withstand a sudden crash. Probably not. Since the device does not have a range finder built into it I would not buy this one since they claim the 2nd generation model will. Will the device be able to figure out the trajectory when you aim at a target that is on top of a hill or when you are on a hill and shooting at a downward angle. This type of shooting is the most difficult to do even when you know what the range is. In other words just knowing the range means little under those types of conditions. Few once a year hunters know that the average range and average skill level of a hunter limits his ability to hit anything to about 100 yards under field conditions. Any experienced hunter who is a decent shot will tell you that if you sight in a high velocity rifle to hit 3 inches high at 100 yards that a dead on hold will mow down any big game animal all the way out to 300 yards. Shots beyond that range become problamatical even for High Master Riflemen because of wind, mirage, bad lighting, and physical fatigue. So it is marksmanship skills that are gained only through thousands of rounds of practice that teach a hunter how to hit from the standing, sitting or prone positions not some fancy computerized wonder machine. Physical stamina also plays a large part in hunting big game so are you in good physical shape if you sit behind a computer all day at work. Probably not. I ask what is next, a robot that does your hunting for you while you sit in front of a computer screen thousands of miles away and push a button that tells the robot to pull the trigger. Don’t laugh this will be available in the not to distant future if you have lots of cash. Perhaps an armed drone would be even better yet. No physical exercise needed, no need to face the dangers of a hunt, no need to practice marksmanship, no worry about being cold, tired and hungry on top of some mountain in Gods country. Yep it does away with all that sneaking up bit some people call hunting. Give me a break are you just a computer geek fantasizing about being a real hunter who actually through experience and practice has mastered every facet about hunting, tracking, field craft and animal habits and marksmanship? And lastly how many geeks would really fork over $1,200 dollars when most are to cheap and stingy to even spend much more than $300 bucks on a bargain basement plasticky and cast iron rifle at Walmart. And can you blame them when they only get 5 days of vacation in Capitalvania because if you leave for longer than 5 days you are running the risk of your boss finding out that if you leave for any longer than that they find out that they can get along nicely without your services at work. I’ll be getting one of these… been saying for years that this is the way to go. Just like star wars! Now we just need laser blasters. or personal hand held rail guns to eliminate all trajectory problems. I don’t hunt animals. They deserve to live in peace, and since animals don’t shoot back,unlike the evil scum humans I did some ‘big gaming’ on for a living in another life, there’s no ‘humanity’ in it if you’re not desperately trapped in the food chain situation where your life depended on hunting. So why not have something like this. Why shouldn’t The People have optimum ‘firepower’? It’s getting to be an ugly world. Maybe even civil war pretty soon. Besides, The 2nd/A never said we couldn’t have robots doing our shooting for us. The G has that. And the 2nd/A never said we couldn’t. And there’s a court case going on right now about a kid down South I think where he mounted a Glock on his personal drone and was on You tune and spotted by gun Nazis and ATF or law enforcement got involved. So we’ll soon see…said the blind Citizens. Why would anyone need this type of scope on short range 45/70 Robert D Loven? Would like to see a side by side comparison with the ATN X-SIGHT 4K PRO 5-20X. Great to see the scope market place introduce new product like this. Very cool! Priced right too. Hopefully when they add the range finder the cost won’t go up too much. Wonder how it would hold up on a semi-auto. It sure would look nice a top my M1A.